We normally refer to China’s Singles Day as the largest e-commerce event in the region, but Suning Commerce Group’s latest announcement proves that brick-and-mortar shops hold tremendous opportunities in the digital battleground as well. The Chinese commercial bellwether, which is also a Fortune Global 500 company owned by Suning Holdings Group, set a new sales record during this year’s festival, and achieved 163% growth across its omni-channels. According to its release, the retailer’s online retail sales set a record with year-on-year growth of 227%, while offline sales achieved 168% growth, with both channels serving 1.96 million customers in total. High-end home electronics and appliances performed best. The retailer recorded the most iPhone sales of any vendor on Singles Day. Also, in the home appliances category, it saw an obvious consumption upgrading in the industry. Sales of large-volume roller washing machines took up 75% of laundry machine sales, while sales of air purifiers increased 300%. The announcement also claims that the company hit US$15 million in sales in the first seconds of Singles Day. Zhang Jindong, chairman of Suning Holdings Group, credited the “smart retail” model for their success. He said the company launched its own “O2O (Online-to-offline) shopping festival”, which lasted 11 days from November 1 to November 11. During the period, the company implemented several technologies to merge the online and offline shopping experience, as well as accommodate the large volume of orders during the festival, one of the biggest challenge that all retailers would meet on the day. The company opened four cashier-less stores across the country to motivate offline shopping. 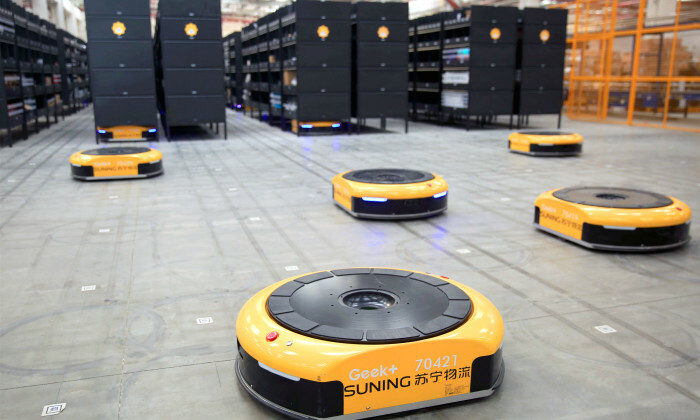 One of its warehouse in Shanghai is equipped with 200 robots that are able to move around the stocking shelves to achieve a “goods-to-people” solution instead of the traditional “people-to-goods” model. The time spent selecting an item has been shortened to 10 seconds – five times more efficient than manual work. The company deployed its first AI-powered delivery robot, “Biu”, in Nanjing on Singles’ Day to deliver items from a neighborhood convenience store to a consumer’s home, a process that took three minutes. Nestle has been actively trying to prevent its rivals from using designs similar to its Kit Kat product and has now taken legal ac.. The partnership saw the jeweller setting up a booth outside ION Orchard which gives out free coffee and croissants. .. This is the first time the EDITION brand makes its foray into Malaysia, while YTL Hotels will be constructing its second JW Marrio..
Solvil et Titus (鐵達時) has, for the first time, abandoned traditional media to go all digital this year with support from newly app..